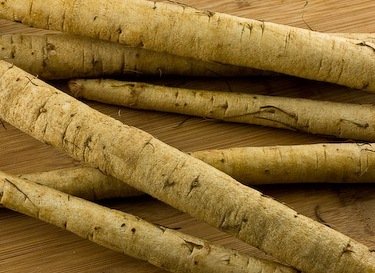 Burdock root gets its name from bur, for its tenacious burrs, and dock old English for plant. Many scientists are skeptical about its uses. Early Chinese physicians, as well as Ayurvedic healers, used this herbal remedies for colds, flu, throat infections and pneumonia. The FDA noted that too much of this herb can cause side effects and lists Burdock as an herb of "undefined safety". However, German researchers have discovered fresh Burdock root contains polyacetylenes, a chemical that kills disease-causing bacteria and fungi. It also reduces mucus and prevents formation of gall and kidney stones. This herb contains vitamin A and selenium, it can eliminate free radicals. Its chromium content helps regulate blood sugar levels. Other qualities of this herb, set forth in the magazine Chemotherapy, identified a chemical (arctigenin) in Burdock which acts as an inhibitor of tumor growth. "This herb should not be used by pregnant women"
Burdock is also known by the names Bardane, Clotburr, Beggars Buttons, Gypsy Rhubarb, Gobo, and Burr. In traditional herbal texts, the root is described as a "blood purifier" or "alterative", and was believed to clear the bloodstream of toxins. Medicinally, the Root has been used both internally and externally for eczema and psoriasis, as well as to treat painful joints and as a diuretic. It is eaten as a vegetable in Japan and elsewhere. It is a mild laxative. It also aids in the elimination of uric acid. The herb contains polyacetylenes that have both anti-bacterial & anti-fungal properties. By improving the function of many organs of elimination (liver, kidneys, bowels), many health conditions can be improved. This Root contains high amounts of inulin and mucilage. This may explain its soothing effects on the gastrointestinal tract. Bitter constituents in the root may also explain the traditional use of Burdock to improve digestion. The polyacetylene constituents have also been shown to have anti-microbial activity. Alterative, diuretic and diaphoretic. One of the best blood purifiers. In all skin diseases, it is a certain remedy and has effected a cure in many cases of eczema, either taken alone or combined with other remedies, such as Yellow Dock and Sarsaparilla. The root is principally employed, but the leaves and seeds are equally valuable. Both root and seeds may be taken as a decoction of 1 oz. to 1 1/2 pint of water, boiled down to a pint, in doses of a wineglassful, three or four times a day. When applied externally as a poultice, the leaves are highly resolvent for tumours and gouty swellings, and relieve bruises and inflamed surfaces generally. The bruised leaves have been applied by the peasantry in many countries as cataplasms to the feet and as a remedy for hysterical disorders. From the seeds, both a medicinal tincture and a fluid extract are prepared, of benefit in chronic skin diseases. Americans use the seeds only, considering them more efficacious and prompt in their action than the other parts of the plant. They are relaxant and demulcent, with a limited amount of tonic property. Their influence upon the skin is due largely to their being of such an oily nature: they affect both the sebaceous and sudoriferous glands, and probably owing to their oily nature restore that smoothness to the skin which is a sign of normal healthy action. Budock's name is a combination of bur, for its spiked seed covers - burrs - that grab onto anything that touches them, and dock, Old English for "plant." Many scientists dismiss budock as useless, but like its seeds, its reputation as an herbal healing agent clings tenaciously because of its subtle tonic benefits and its intriguing potential as a treatment for cancer. Throughout history, Burdock has been recommended for an astonishing number of illnesses. Ancient Chinese physicians used it to treat colds, coughs, tonsillitis, measles, skin infections and snakebite. Traditional European and American herbalists and homeopaths prescribed it for colds, arthritis, gout, stomach problems, fever, canker sores, leprosy, boils, gonorrhea, ringworm and infertility. They also considered it an excellent diuretic, and prescribed it for urinary tract infections, kidney problems and painful urination. But Daniel B. Mowrey, PhD, director of the American Phytotherapy Research Laboratory in Salt Lake City, Utah, and author of The Scientific Validation of Herbal Medicine, insists that it deserves its enduring place in herbal healing because of its value as a tonic - a subtle strengthener with cumulatively helpful effects. "Burdock's action is mild, but real," Dr. Mowrey explains. "It has antibacterial and antiviral powers, and it reduces blood sugar, which helps prevent diabetes. I recommend using a little every day. And when you're ill, use it in addition to standard therapies."